Produced by the talented developers at 34BigThings, Redout is a futuristic indie title that provides big budget thrills. It’s proven immensely popular with racing fans, earning accolades for its beautiful visuals, precise controls, and near perfect depiction of virtual velocity. The game is packed with features designed to keep you in the driver’s seat. A rewarding career mode, the ability to race against 12 other players, and 25 incredible race tracks are just some of things awaiting you in Redout. The game features the kind of stellar design and endearing spirit that makes indie gaming so great, which is why NVIDIA chose to include it in the company’s GTX Indie Bundle promotion. The GTX Indie Bundle allows gamers who purchase select GTX video cards to grab a free copy of one of three breakout indie hits to enjoy on their new hardware: Redout, Maize, and Raw Data. So, what’s in store for GeForce owners who boot up Redout? Speed. Lots and lots of speed. Redout’s main offering is a large roster of space age vehicles that rocket around the intricately designed courses at high speed. 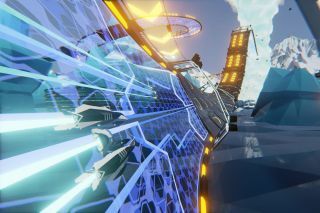 It pays loving tribute to fast paced racers of the past like Wipeout and F-Zero. Those are big shoes to fill, but thankfully, the team at 34BigThings are veteran racing fans who have lots of experience with the genre. That familiarity with the racing genre definitely shines through in Redout. The sense of speed is impressive, but so is every other aspect of the game. Keeping your vehicle on track is easy thanks to the superb vehicle physics that offer responsive handling and realistic movement. You’ll also have the benefit of tight controls that let you make precision adjustments on the fly, especially if you use a control pad like the NVIDIA SHIELD Controller. The race tracks are also designed to maximize velocity while still challenging your piloting skills. Expect plenty of tight turns, steep banks, and vertical loops that will require a steady hand on the wheel. It all combines for an exhilarating racing experience that also delivers incredible visuals at a butter smooth 60 frames per second. While the game runs great on a range of systems, gamers who own powerful hardware like an NVIDIA GTX video card will be treated to some spectacular effects. 34BigThings also included a VR mode that lets players experience the game’s blistering speed with total immersion. But developing for VR wasn’t a simple matter. There were technical challenges to tackle and the player’s senses to keep in mind. Put it altogether and you have a racing experience that has captured the hearts of passionate racing fans everywhere. Offering a bevy of modes, tracks, and vehicles, it’s a feature laden title that will keep players in the driver’s seat for hours on end. It’s already built a loyal following, but Franchi notes that NVIDIA’s support of indie games could help bolster their efforts to reach a larger audience. The future is wide open for Redout, but before 34BigThings races ahead with planned features like a new map offering five more tracks, they’re going to take a moment to enjoy what they’ve accomplished so far. Gamers who purchase a select GTX video card are eligible to receive a free copy of one of three hit indie games: Redout, Maize, or Raw Data. Click here for more information on the GeForce GTX Indie Bundle.